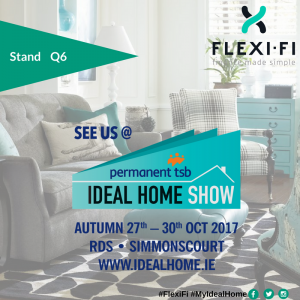 Flexi-Fi are delighted to announce that we will be attending the Ideal Home Show at the RDS. The Permanent TSB Ideal Home Show takes place every Spring & Autumn at the RDS Simmonscourt in Dublin. Get directions . Flexi Fi are delighted to be attending Ireland’s biggest & best known home improvements show. Visit us at stand Q6. Visiting Ireland’s best loved home improvements show will give you the ideas and the inspiration you need. Turn your home into the stylish, comfortable and welcoming living space that you can be proud of. The show will have over 230 exhibitors so there will be something for almost everybody. 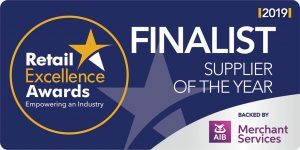 There will be lots of events and entertainment taking place from guest speakers including Anna Daly (TV3 presenter), Chef Adrian (Celebrity Chef) and Collette Ward (Show-house Designer). See full timetable. Why not download the App in advance from the App store or Google Play, to plan your day? Search FlexiFi to find where we are located on the event map, request a meeting with us and find out more. Once you find what you would love for your home, then why not apply for Flexi-Fi and get up to €15,000 in minutes to buy what you want *, when you want from participating retailers. The application process is simple, apply online using any mobile device and enjoy a no fuss application process. Receive a credit decision in minutes! Come visit us at stand Q6 to find out more and begin our simple application process. We look forward to seeing you all there. Follow us @FlexiFi_IRL and stay up to date on our upcoming events.